Up pops the Start menu. 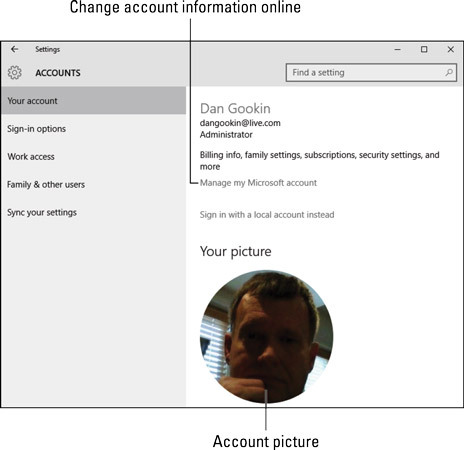 Click your user account picture atop the Start menu. The Settings app opens to the Accounts area. Your account information is shown on the screen. Account information in the Settings app. Each of the items on the left side of the Accounts screen lets you change an aspect of your own account or add other accounts to the laptop. Most basic account information is managed on the Internet by accessing your Microsoft online account. In the Settings app, choose the link Manage My Microsoft Account to visit the web page and make changes. Changing your Microsoft account affects all your Microsoft products, which include other computers with that account, subscriptions to the Office 365 service, as well as email and other Microsofty things.